For those of you who are not familiar with the Kawai company, they are a smaller privately owned international piano company which designs and produces only digital & acoustic pianos. Their pianos are in Universities, schools, churches, teaching studios, and homes throughout the world. 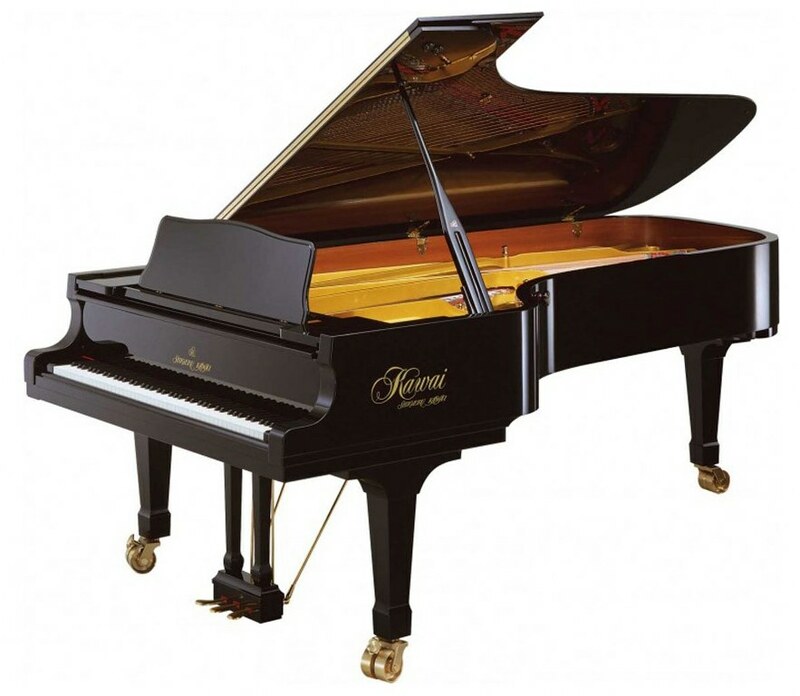 Kawai has been producing quality pianos for decades although they are generally not as well known as Yamaha, Roland, Casio, and other high profile digital piano makers because those other companies make so many other types of products aside from pianos. I personally know many music teachers and professional musicians who use and play Kawai pianos and like them very much. In fact, Kawai also produces a line of acoustic grand pianos for the Steinway piano company called Boston which are also impressive pianos. You definitely have to be good at what you do with respect to producing pianos to be associated in building pianos for the Steinway piano company. Kawai international headquarters is in Hamamatsu, Japan where most design and development takes place for their products. The Kawai name has always had very good resale value and they are rivals of the famous Yamaha piano company, also headquartered in Hamamatsu, Japan...small world, isn't it:). When it comes down to what is truly important in a digital piano, it's all about the key action & piano sound authenticity along with good solid pedaling control along with a big beautiful tone. In other words, it's all about playing the piano, and when it comes to digital pianos, although some of them have very cool digital features with 100's of extra sounds, multitrack recording, rhythm, and so on, without the piano being able to play and sound like a real good natural acoustic piano, nothing else really matters to me. 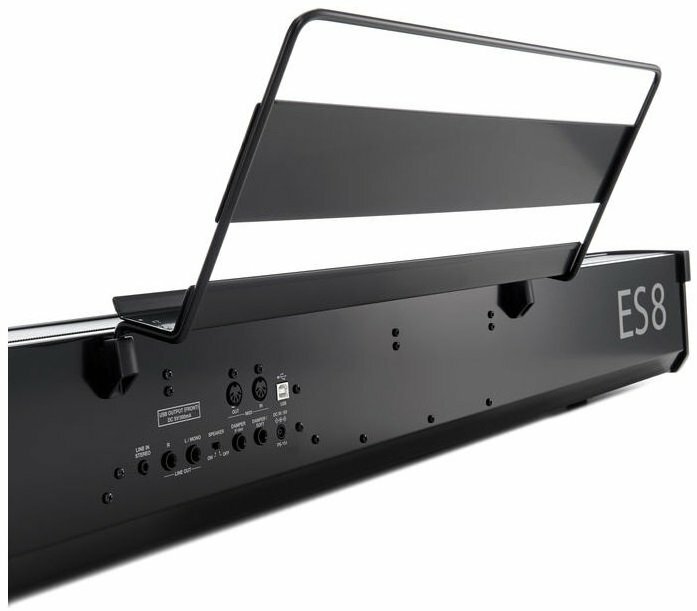 The ES8 first and foremost is, in my opinion, the best self contained digital piano on the market today. I don't say this lightly but after playing all of the name brand self-contained (with internal speakers) portable digital pianos out there, the ES8 "checks all the boxes" with regard to an instrument which provides a tremendous piano playing experience along with some usable and practical digital features without being overloaded with stuff that many people may not use. . When it comes to key action realism and movement, the newer ES8, Kawai has introduced its new counter-weight balanced RH3 key action. All the digital piano manufacturers try to make you believe their key actions are the best because after-all, they are trying to sell you their products. Because of this I have seen some exaggerated claims by these people saying how good their pianos are when if fact, some of them are not so good. But with the ES8 RH3 (aka: Responsive Hammer III) counter-weight key action (see above left cutaway pic), the feel is noticeably more realistic as compared to a good acoustic piano and the difference that I believe is notable is the keys are a bit firmer to,press down, but without being too firm, and the key returns to resting position more quickly without being too quick. What this translates to is a much more responsive natural key movement which allows for more precise key repetition, better technique, and ability to play complex music without key hesitation or slow return. It also gives the player a better connection to the music because the key moves and responds so much more accurately. Counterweights are actually installed into the front of each black & white key (see above pic) to balance the touch weight more accurately against what you normally get playing at the back and middle of the key. 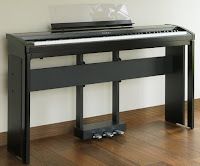 Counterweights are not new in digital pianos but they are unusual to be found in this lower price range, and Yamaha doesn't offer counter weighted key actions until you get over $5000 in their digital pianos. 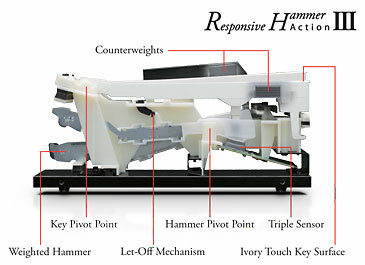 The ES8 graded hammer weighted keys have 3-electronic sensors under each key for better repetition recognition when playing faster music or more complex arrangements unlike some other digital pianos under $2000 with only 2 key sensors per key. All of the ES8 keys have a good balance to them up & down the keyboard and the synthetic ivory-feel matte finish keys really adds a nice touch and helps with absorbing sweat from the fingers. That matte finish on the keys also cuts down on the glare you would otherwise be getting from regular white plastic keys, and they look nice. If you are a piano player with years of experience playing real good acoustic pianos, then you would easily be able to feel the difference in this new key action and how accurately it moves compared to previous key actions as well as compared to some other brands. Another thing worth mentioning about the key action is that Kawai has built a feature into it called "let-off," otherwise known as "escapement." 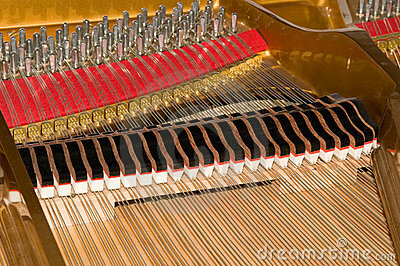 The let-off feel is a feature of real Grand pianos whereby you can feel a slight hesitation or "notch" as you press a key very softly and slowly on a real grand piano. This key action hesitation is a by-product of the way real key actions work and how the parts of a real key action move. It's a complex mechanical system on a real piano and although those specific acoustic action parts (see left pic) don't exist on a digital piano, the simulation is a pretty good one in terms of how the action moves and how it triggers the Let-Off "feeling." What all of this does is allow a person to have more control over subtle and delicate passages of music. Based on my playing experience with the ES8, Kawai did a very good job simulating this let-off feel without having it be clumsy or too light or too heavy as it is in some other digital pianos with this feature, so Kawai definitely has one of the best. Ok...now let's talk about piano sound. Piano sound is a funny thing because what one person thinks sounds good to them, another person may think that same sound is not what they like. So in reality, piano sound realism is somewhat subjective. However, there are certain piano sound standards that you will find in a real acoustic piano and the piano sound gets better when that acoustic piano has better strings, a better soundboard, better tuning pins, a better scale design, better felt hammers, and so on. To achieve a realistic piano sound in a digital piano, that piano needs to have the sound start with quality real acoustic grand and upright pianos along with a professional recording process to capture the original piano sound one note a a time, along with capturing organic nuances of the piano itself, and then finally being able to put that sound out through a high quality internal speaker system so that the piano is full and resonate with enough bass to satisfy the player/listener. The ES8 has an upgraded piano sound chip with more piano processing power and memory than did the previous model along with a noticeable improvement in dynamic range and tonal quality. Beyond the increased level of overall piano sound realism along with Kawai sampling all 88 keys one at a time of real acoustic pianos, the 4 main piano voices on the ES8 are actual piano "samples" that originate from 4 distinct well known Kawai acoustic grand and upright pianos. Kawai recorded brand new piano sounds from their 9' EX concert grand piano, 9' SX concert grand piano, 6'7" SK5 grand piano, and their 53" tall K-series full upright piano. Along with those specific piano tones built into the ES8, Kawai included 6 acoustic piano variations including jazz piano, pop piano, warm piano, etc. The EX grand piano sound is definitely the brightest and boldest piano stereo tone with huge resonance and lots of string vibration, something that would mix well with an orchestra or band, or pop music. The SX is noticeably more mellow but still can be plenty loud, resonate, and powerful and would be great for classical music, jazz, and ballads and it was personally my favorite piano sound. The SK5 piano reproduction seems to be a little more personal and not as full but still quite nice, and then the upright piano sound reproduction gives the player an up close piano tone listening experience that you would normally get from a real upright piano because those piano strings & hammers are so much closer in distance to the player. I can honestly say that if you don't find an acoustic piano sound on the ES8 that you like, then you just aren't trying. The piano volume sensitivity and tonal changes as you play across the keyboard softly to very hard really are quite smooth and balanced with incremental changes that transition very much like a real grand piano with no jumpiness or volume/tonal gaps like I have heard on other piano brands. When you couple those things with Kawai's 256-note polyphony chip for excellent piano processing power, it's hard to go wrong regardless of your playing skill level or the type of music you choose to play. The ES8 does it all very well considering it's lower price for what you are getting. In fact, I had a difficult time taking a break from playing the piano sounds on the new ES8 along with the responsive key action because I was enjoying myself too much. It's also interesting to note that the ES8 is using the same piano sound chip as is found in the top of the line Kawai CS11 upright digital piano which sells for more than $8000. So, the ES8 has Kawai's best piano sound chip unlike other digital piano brands (Roland, Yamaha, etc) in this price range that use lower quality sound chips from their brands. If all the ES8 could do was play acoustic acoustic piano sounds, then that would be enough for me...but it does so much more that I also like. Pedaling is always an important part of playing music on a piano and if you don't know how to use the pedals, especially the right damper/sustain pedal, then you are really missing out. 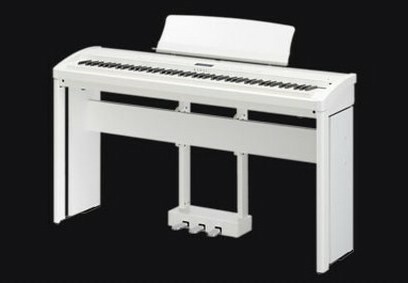 The Kawai triple pedal unit is an optional purchase as is the furniture stand. You would need to have that optional furniture stand ($259 discount price) in order to use the triple pedal lyre ($169 discount price) which is designed to look like a little grand piano. A heavy duty piano style single sustain-damper pedal is included with the purchase of the piano alone and is fine when playing most music. In fact that single damper pedal can also trigger the half-damper effect when using the piano alone, and that is a feature not usually found on portable digital pianos. Half-damper effect allows for for incremental amounts of sustain when using the pedal as opposed to just on & off. 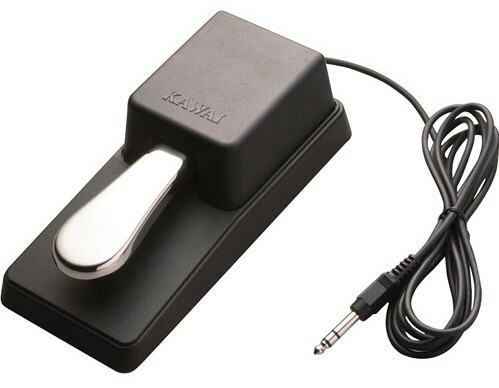 Many single sustain pedals under $2000 on other brands do not trigger half-damper control, but the Kawai pedal does, so that is a good thing, especially when you play at a higher skill level. Also, the half-damper effect is also adjustable so that you can customize it to the way you use the damper-sustain pedal. 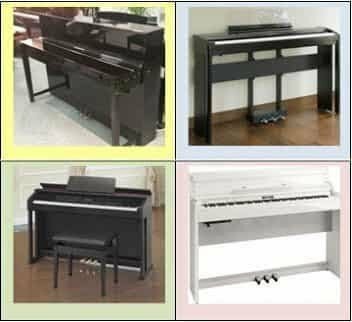 But if you want the piano to look and act more authentic, then I recommend you purchase the furniture stand and triple pedal lyre, especially if the piano will remain in one spot in the home, church, school, or studio most of the time. The piano pedals do work well and replicate the experience of a real acoustic piano with natural piano resonance across the keyboard (which is adjustable) and especially in the upper octaves where it's needed. The soft pedal on the left not only reduces volume momentarily when holding it down when you are playing piano, but that same pedal can trigger a digital rotary speed control (Leslie speaker simulation) for pop & jazz organ sounds from slow to fast or fast to slow to simulate the popular "Hammond B3 sound," and it works well. 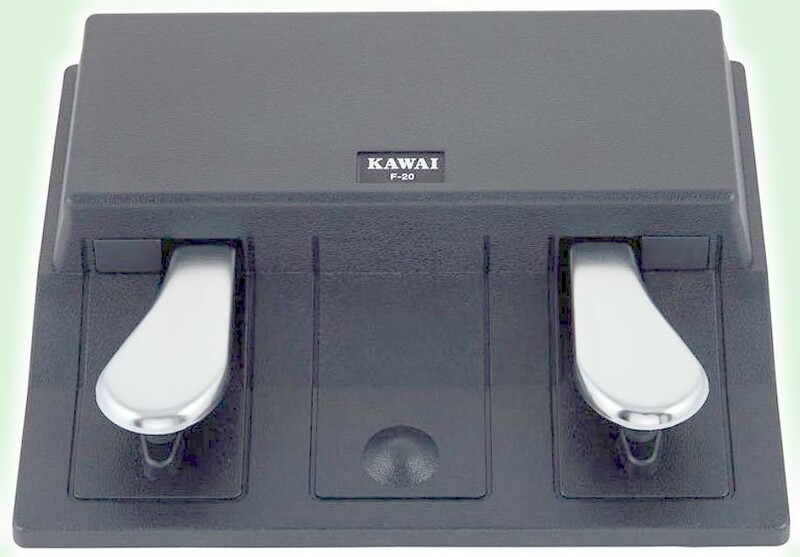 The optional Kawai dual pedal unit ($125US internet price) is also a great pedal system because when combined with the single sustain-damper pedal that comes with the piano, the portable dual pedal then allows you to have 3 pedals that function independently like a real piano, but they are also portable so you can easily take them with you. The other advantage to the dual pedal is that each of the two pedals can be independently programmed to access other useful features when playing your music with rhythm & accompaniment such as rhythm start/stop, drum fill-in, accompaniment part changes, rotary speed control, etc. In fact, you can have use of all 5 pedals in real time if you get the triple pedal furniture lyre with the furniture stand along with the portable dual pedal (not sure how many people would actually do that, but I would:). Finally, the piano decay time (which is adjustable) and volume when sustaining an acoustic piano sound with the single damper pedal or triple pedal lyre is very good and better than most digital pianos I have played and this aspect of playing piano is very important. As for the other instrument sounds in the ES8, there are 34 tones all together including the acoustic piano sounds, and the other instruments are equally good in their own way including the vintage electric pianos, string symphonies, jazz and church organs, choirs, and harpsichords, among others. The electric/digital piano sounds including reproductions of vintage Fender Rhodes, Wurlitzer electric pianos, Yamaha digital DX7 keyboards, and other famous electric piano sounds are really outstanding. Kawai cannot actually list the specific names of those instruments in the piano menu because of copyright protection laws, but instead they list the electric pianos generically with names like "60's piano" which is the famous Wurlitzer electric piano of the 1960's, or "Classic EP" which is the famous Fender Rhodes of the 70's, etc. But when you hear those sounds you know right away what they really are assuming you are already familiar with those instruments. When you combine a couple of those sounds with the built-in pro quality special effects including a variety of chorus, phasers, tremolo, delays, brilliance, EQ, and other effects, the realism of those electric piano sounds are amazing and noticeably better than any other brand I have played in a self-contained portable digital piano under $2000. The other nice thing is that you can combine a digital piano tone with any effects you wish and layer that electric piano with an acoustic piano sound, string sound, choir sound, or any other instrument sound and not loose any of the effects you selected for the electric piano. In other words, when you combine two sounds together in many cases the effects don't work. But on the ES8, you can have them on the instrument sound you need when layered with another sound where you don't want the effects. Very few digital pianos can do this and it's great for people (like me) who can appreciate having this kind of control over layering 2 instruments together and having that layered sound be perfect and then saving it in user memories for later recall without having to recreate that setup all over again. If you want to balance the volume between any two layered instrument sounds so that the relative volume is where it needs to be, there is a quick layer volume adjustment that is easily accessible and allows for fast adjustments which is important when combining any two sounds together. On many other digital pianos I have played this can be a tedious process and not intuitive at all. So I was impressed with how easy the control panel buttons and menu was to operate given all the features this piano has jammed into it. When it comes to the non acoustic piano instruments, I'd rather have a small group of super excellent instrument tones (like the ES8) than hundreds of average or below average sounds which is typically what you'll find on the other brands and models, The stereo symphonic strings are the best I've heard in any portable self-contained instrument along with the organs and choirs of the ES8. However, since the ES8 is limited to just 34 total instrument sounds, some people have told me that they prefer more instrument sound selections because they want more variety because of the type of music they play and there are other digital piano brands and models that have many more self contained instrument sounds such as Roland and Casio. But I have some news for you assuming you didn't already know about this.You can get hundreds more instrument sounds coming out of an ES8 including brass, woodwinds, synths, guitars, and just about anything else you can think of, This is done by simply connecting an iPad to the ES8 and then down load a variety of pro sounding instrument apps that can be triggered by the ES8 through USB MIDI connection and then run through the ES8 internal speaker system to hear those sounds. Some of those apps have a small cost and some are free. An example of this is an app called "Sample Tank." The sounds are chosen by easy to understand icons in instrument groupings and then a list of instruments comes up that you can select from. There are also more great instruments you can get with an in-app purchase. It's easy to do and the result is impressive, along with being able to add that sound from the app in real time to the sounds you are using from the ES8 (such as acoustic or electric pianos) or play those external sounds independently without hearing the built-in ES8 instrument sounds. Pretty cool as far as I am concerned. There are 28 digital memory slots in the ES8 that allows you to save your favorite setups so you don't have to recreate them all over again and lets use access them quickly so you do need to search for the specific sound, effect, and other functions you would need to make that favorite setup. You just recall that setup you made in the "registration memory." There's even a dedicated button on the control panel to select the registration memory you want to save or to recall.Speaking of control panel, the Kawai ES8 control panel is above the keys with 26 big, round, easy to see and easy to press panel buttons going across from left to right. I love it when manufacturers give the user/player intuitive and easy to press (light-up) buttons because it takes away at least some of the guesswork when it comes to accessing the popular features in the piano. The ES8 control panel also has a built-in LCD display screen and although it's a bit small, it's still large enough to tell you what's going on when selecting functions. The dedicated buttons give you access to some of the most requested functions including metronome, key transpose in real time, rhythms, registration memories, USB flash drive recording & playback features, reverb & special effects, split keyboard, and the 7 instrument sound groups. Within those instrument sound groups include some exceptionally realistic string symphonies, choirs, synth-bells, harpsichords, marimbas, church and pop (B3) organs, basses, and other tones. As far as the digital LCD menu goes, it allows access for a huge number of cool features including the following: keyboard Touch (curve) Sensitivity Controls such as Light+, Light, Normal, Heavy, Heavy+, Off (Constant), User 1, User 2, Voicing which means being able to further customize the piano sounds to your liking having Normal, Mellow 1, Mellow 2 , Dynamic, Bright 1, Bright 2, or User 1 - 4. There's also further piano custom editing with Resonance, Noise & Effects which include String Resonance, Damper Resonance, Damper Noise, Fall-back Noise, Key-off Effect, Hammer Delay, Topboard, Decay Time, Soft Pedal Depth, The Reverb control includes a variety of impressive natural reverb/echo room sizes such as Room, Lounge, Small Hall, Concert Hall, Live Hall, Cathedral along with editing control of Reverb Depth & Reverb Time. Temperament & Tunings including Equal (Piano), Pure Major, Pure Minor, Pythagorean, Meantone, Werckmeister, Kirnberger, User Temerament, Key of Temperament, Stretch Tuning, Stretch Curve / User Tuning, User Key Volume, Half-Pedal Adjust and Minimum Touch. The "user key tuning and key volume" is worth noting because it allows individual notes to be adjusted to your particular tastes (and ears) so that you can make incremental adjustments rather than global overall adjustments. This is a pretty cool feature and a great thing to have. One of the things that people often ask me about when it comes to these kinds of advanced digital pianos and being able to use some of the special piano sound editing features such as the ones I mentioned above are, "will I understand how to use these things and operate them easily?" 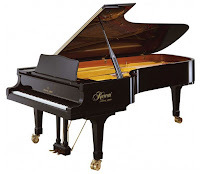 That is definitely a fair question because although it's really great to be able to customize the piano sound and response to your personal tastes and playing experience, if the functions on the piano are not easy and intuitive to use, it is unlikely that you would use those great features very often. Also, even though the piano owners manual may give an explanation of how to use these very cool features, understanding it all still might be somewhat challenging. It is for this reason that Kawai came up with what I consider to be a most useful and fun feature for the ES8...a Virtual Technician iPad app. Basically instead of going into the smaller piano display screen menu and trying to find these different parameters and features, the Kawai VT iPad app (free in the app store) allows the user to change functions and settings of the "Virtual Technician" in real time using a very well done, well constructed, intuitive, visually pleasing touch screen iPad app that makes it a real pleasure to change settings so that the piano sound, key action response, and pedaling will be as perfect as it can possibly be for the type of music you want to play and how you want to play it all. With a touch of your finger on the Kawai ES8 iPad touch screen VT app, the results are actually pretty amazing and there is no other digital piano brand that I know of which has this feature available to its users who are looking for new digital pianos under $2000. I have personally tried it and it works fast, is easy to use, and makes a huge difference in setting up the piano in exactly the way you like it. Even though the ES8 has preset piano tones in its sound library as I mentioned before, there are many people who want to move beyond the "pre-set pianos" and do a bit of customizing, and I find this VT iPad app indispensable in getting the result you want quickly and easily. Whether it's setting up the key touch sensitivity, Stretch Tuning and Temperament parameters in deciding how you want the piano tuned, the Voicing of the hammers and how they behave mellow to bright, hard or soft, changing Pedaling response resonance along with many other things. the iPad interface allows for subtle or big changes in varying degrees. Given that the ES8 is internet priced at less than $2000, this kind of useful app is very unusual to have access to. In my opinion, if you don't have iPad and want an ES8, you might considering purchasing an iPad just for that reason alone:), although there are many other useful piano/education related iPad apps you can have access to which are not available for Android and makes for purchasing an iPad even more worthwhile. A lot of people like to record and playback their music for a variety of purposes. This includes lesson practice, song writing, multitrack MIDI song play, and iTune playalong. But for this to happen a digital piano must be able to record and playback in all popular formats which includes MP3, audio wav file, and MIDI file, and the ES8 can do that. If you want to record and practice your piano music and play right & left hand separately and then playback while you record the other part and then play back both parts simultaneously, you can do that on the ES8 with 2-track MIDI recording with the ability to save 10 of your own songs into internal memory. Also, you can record 1-track audio wav/MP3 files for true/actual sound playback while using the ES8 overdub function to record multiple new parts on top of the original recording and then hear them play back as one complete song on any MP3/wav device. This is a very useful feature and great for songwriters and performers because when playing back your multi-track audio recording, you can play live over the top of it and sound like you have a complete orchestra or band all having been played by you:). The recorder system has a number of editing features as well being able to convert MIDI songs to audio songs instantly. Recording yourself can be a lot of fun and if you have never done it, it's not difficult and when you hear the results it can be helpful to your playing in many ways. Speaking of fun, to me, if playing music isn't fun, enjoyable, and meaningful, then you might as well take up another hobby. To add to the enjoyment of playing piano, adding other sounds, and recording yourself, the ES8 has what I consider to be a "bonus section" called Rhythm accompaniment (aka: rhythm section). I will say even if the ES8 did not have this bonus section it would been fine without it. But having it really adds to a person's musical enjoyment if they take advantage of it. If you are the kind of person who enjoys playing or listening to pop music, Jazz, Latin, Country, Big band, Swing, Christmas, Gospel, Funk, Rock, Kids music, standards, alternative, dance, disco, light rock, Disney tunes, or any Rhythmic style of non-classical music, then you are like me. I love classical music but I also love and play all the other styles (most of them anyway). The ES8 has a one-man/woman band feature which allows you to play long with interactive accompaniment backgrounds that are professionally arranged by Kawai pro musicians. These interactive chord backgrounds are based on the right and left-hand chords that you play live and then these accompaniments will follow you on the keyboard. This system works best when playing right hand melody or right hand chords while playing full left hand chords. You select a style of music you want from the 100 rhythm (x 2 variations) 4-part accompaniment system and then you play the song you want and a full band including drums, bass player, guitar player, and other accompaniment players comes in and backs you up and makes you sound great! The drummer can even be set to do a professional drum fill after a certain amount of measures so the music sounds more "live." I happen to enjoy playing with this kind of system and it helps me play music I otherwise may not be able to play in a traditional way and it certainly allows me sound better than I really am while helping me with rhythm and timing while interacting with "the band." You can set your own tempo, decide if you want to play full right/left hand piano music over the top of the band, or if you want to really simplify things and play simple one-finger left hand chords on the root note and play a simple one finger melody on the right hand. The simplified one finger system is great for very young children who cannot play or for adults who don't want to take years of lessons but want to play and have fun. It even displays the left hand chord for you so you know where you are at. You can also play the drum patterns separately to play along with the drummer or you can use it to learn real time rhythm and timing instead of using just the digital internal metronome for that purpose. Within the interactive auto-chord accompaniment section is also some rhythm editing functions such as being able to activate automatic drum fills to make your music sound more live, to be able to change rhythms in real time from one to another without interrupting the flow of the song your playing, and also be able to activate an "ad-lib" feature which is super cool. When you select the "ad-lib" feature while using the rhythm accompaniment chords, the last 17 black & white keys on the piano turn into "ad-lib" riff makers and when you press any one of the last 17 keys, that particular key will "play" a short "riff or ad-lib" part that synchronizes with the chord you are playing with your left hand along with the style of rhythms that are playing. If you have ever seen a pro keyboard/piano player do a short riff or solo on the right hand melody keys while the rest of the band plays, then that is what the "ad-lib" feature will do for you only you just hold any of the last 17 keys and each key will trigger a different and impressive riff pattern created by Kawai pro musicians. Each of the 17 ad-lib patterns even change patterns/intervals depending on how many times you press the same key, so it makes it sound more live rather than "canned." However you need to time it so that you press on one of those 17 keys exactly on the down beat syncing up to the tempo you selected, so it will line up correctly with the beat...otherwise it doesn't sound good and will be off-beat. So it does take some ability to use use it correctly, but if you have pretty good rhythm and timing and you want to sound way better than you are, then when you use the rhythm accompaniment feature and the ad-lib feature together, you will definitely have loads of fun, sound great, and play music you have not been able to play before or at least have more fun doing it. I recommend to to everybody who loves music regardless of your piano playing skill level. One other thing about the accompaniment chord styles...many of them sound musically real and not fake or cheesy...although there are a few styles which could be better but I am not looking for perfection here. The bass lines are super cool, drum patterns sound good and full, and accompaniment instruments overall are satisfying. It's not the absolute best auto-accompaniment system I have ever used, but for this model and in this price range, it's much more than I expected and something that I believe adds a lot of value to the ES8...at least it does for me. Another way to interact with the ES8 is through MIDI song files. I already mentioned this briefly but wanted to expand on it. Although the ES8 does play General MIDI song files which is a popular multitrack MIDI format for song playback, the ES8 cannot always play those GM song files correctly. This because full GM format requires a minimum 128 instrument sounds including brass, woodwinds, stringed instruments including banjos, harps, acoustic guitars, etc to play back the songs correctly and the ES8 only has a total of 34 instrument sounds on board with no brass, woodwinds, reeds, and other non piano instruments. So if a popular MIDI song file that you download from the internet (from Mozart, Elton John, Billy Joel, Movie themes, Big band, etc) calls for a trumpet, saxophone, or banjo as an example, the ES8 will automatically substitute some other sound that it has in its 34 instrument (put accompaniment tones) sound bank instead. Sometimes this works really well, sometimes OK, and sometimes it does not sound so good. But...at least it can play back multi-track MIDI song files that are available on the internet and much of the time those songs sound great depending on the musical song style. When playing back regular "piano only" MIDI song files, then the ES8 sounds spectacular and better than any other piano model under $2000 I have heard. Regardless of which songs are playing back, you can slow down and speed up the tempo, you can independently transpose the song's key up or down for singing purposes or to play in a key that's more comfortable for you, you can remove (mute) the melody line or any other part of the song so that you can play-along without hearing that part in the song, and you can adjust song volume independently of the ES8 master volume so you can play along and balance your volume against the song's volume. All of these interactive accompaniments, MIDI songs, and ad-libs are great ways to learn "Improv" (aka (improvisation). One of the most challenging and difficult things for piano students (including my own) and recreational players to learn is "improv," but yet most people would love to be able to play without music or be able to add extra flare to playing the song while reading music. All of these extra functions and features can and do help in this way so I encourage and recommend it. There's obviously a lot you can do with this new ES8 besides just playing piano, and if you take advantage of at least some of these very cool additional functions and features, then I think you'll be amazed at how much more musical enjoyment you'll have. I think the ES8 also looks very attractive for its size in its semi-gloss black or white metal cabinet along with its surprisingly powerful internal speaker system of 30 watts going through two speakers (within speaker enclosures) coming up through the top of the piano which is where it should be as opposed to the back or underneath the piano. The actual acoustic piano sound is resonate and full and I was impressed with how good the piano sound was coming through its own speakers. It can get very loud and much louder than I thought it could while keeping the piano sound under control and still very expressive whether at high volume or low volume. The ES8 cabinet has clean lines, nice styling, an easy to see & use set of light up buttons above the keys, and an easy to read LCD screen. It's compact and yet seems to be built well weighing in at just 49lbs and can be moved around for a variety of reasons such as moving it from one room to another, taking it to gigs, using it in a summer home, in a church where you need to set it up and take it down, at a school when space can be limited. Kawai also has an optional proprietary semi-hard carry-case for the ES8 which can be purchase for extra cost. The optional furniture stand and 3-pedal lyre assembly together add about $440US more to the price (they can be purchased separately) but they are nicely matched to the ES8 cabinet and they really look great when they are attached. The optional furniture stand and pedals (they work well) also add stability to the entire package so that the piano is more secure and plays with little movement and I liked it a lot. In fact it's the only portable piano I know of which looks somewhat elegant even for its compact size. If you just order the ES8 by itself, then it comes with a smaller standard metal music rack for sheet music. While this rack is OK, it would be better to have nicer looking and larger music rack. 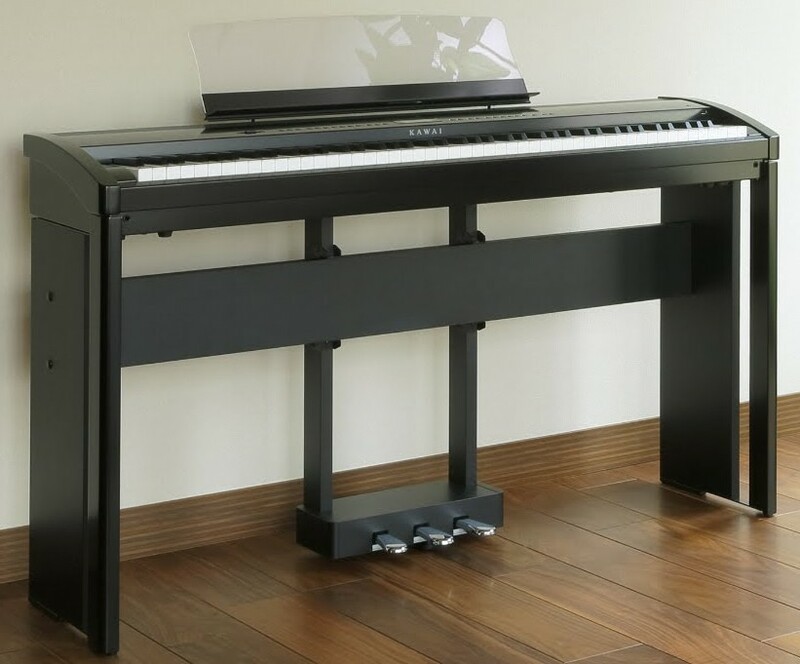 So when you order the optional furniture stand, Kawai includes a vastly upgraded plexiglass music rack mounted into a sturdy metal base at no charge. There is also more space on the bottom front of that rack to hold sheet music and books. The rack cannot be ordered separately so if you like it, you need to buy the stand to get it...but I definitely recommend doing that if you can. As far as connectivity on the ES, Kawai did a very good job of including what most people are looking for which includes MIDI (in/out), USB to Host, USB to Device (for flashdrive input), Speaker system On/Off control switch, Line-in stereo audio input, Line-out (L/Mono, Right) including separate menu controls for output volume, Single damper Pedal Input (for F-10H), optional dual damper R/Soft Pedal (F-20), Triple Pedal Lyre (optional), and two headphone jacks...one on either side of the piano front. I really like how Kawai put in the two headphone jacks on opposite ends of the front rather than both mounted underneath or on the piano on the left side only like many other brands do. This is helpful because when you select the "four-handed" play mode, two people can play the same octaves at the same time on the keyboard because that mode splits the keyboard electronically into two 44-note keyboards and turns the left hand into the same octaves as the right hand so that two people can play identical notes. This is useful when two people are practicing the same piece at the same time, and the ES8 headphone jack positions make it easier to do that. Also, when using a good set of stereo headphones, the Kawai piano samples sound outstanding through headphones with good stereo piano movement through the sound field along with excellent tone reproduction. Sometimes when playing through internal speakers and then through headphones, the quality and volume of sound is not consistent on many digital pianos. But with the ES8, I found the sound reproduction to be very consistent both ways, and that's not easy to do. 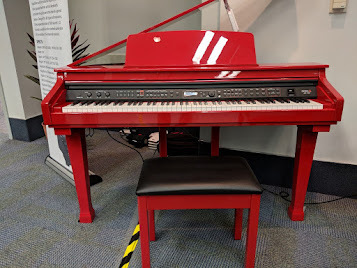 The ES8 also has the ability to turn off its internal speakers with a switch in back of the piano assuming you would want to do that while the piano is connected to external speakers, or have the internal speakers on for the player to monitor their playing. I will say that when the ES8 is connected to a good pair of external monitors for home use or a good quality external speaker system for use in church, school, or a big space, the ES8 sounds like a big acoustic grand piano. You would actually think there is a real $100,000 9' grand piano in the room if you didn't know the sound was coming from the ES8...it's very impressive. With regard to connecting external devices to the ES8, there's also a stereo audio input mini jack for running iPad, iPhone, or computer stereo sound directly into the piano speaker system (or through headphones) which is very useful and not something always found on digital pianos. In the final analysis, if you are looking for a high quality piano playing experience along with a good looking compact piano cabinet and design which can also be portable if necessary, then I would highly recommend the Kawai ES8 as an exceptional value, especially as compared to other new digital piano models near or under $2000. In fact, the best way I can describe the ES8 is that most everything else in its product category and price range is a Toyota Corolla and the ES8 is a Lexus LX:). However, there certainly are a few other good digital piano alternatives out there in this price range as well, so the ES8 is not the only choice. The ES8 covers a lot of "musical bases" very well, particularly with its impressive RH3 key action that is smooth and responsive and feels great, and I really have do enjoy playing it. The only problem I had with this piano was trying to get away from it because I enjoyed the playing experience so much:). 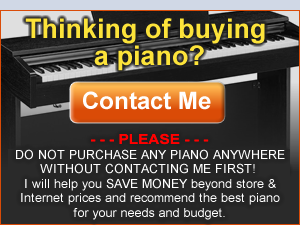 I always advise people to do their shopping homework and research and then contact me for more advice and info on getting even lower prices than internet, amazon, store sales, etc on brand new digital pianos. Hi Tim, this is a wonderful website to learn. Very helpful review Tim, and I've enjoyed your others as well. Until this morning I was leaning towards a Roland FP-80 but after a side-by-side in-store comparison with the ES8 it's a no brainer. I'm vaguely considering picking up the ES7 instead, to save some money, but I want this to last a long time and I'm okay with the additional expense. I'm assuming you'd agree that the ES8 is the way to go. Glad to have found your blog! Thanks! After reading this great review and trying it out I bought an ES8. After using it for a few weeks think it is amazing! I've had many keyboards over the years but this one is a different league - the key action and piano sound are so incredible. It's the best purchase I've ever made! or will they decay along with the piano ?...very important ! Yes, the ES8 strings can remain sustained with the pedal held down while layered with the piano. There is a function setting in the piano that will make that happen. Please email me for more info and I will give you details on exactly how this is done on the ES8 along with more interesting and useful info. You say that the furniture stand for the ES8 is optional. So is there another more portable type stand that comes with this model, or can you purchase one separately? Kawai does not make a separate portable (collapsible) piano stand. You would need to buy one from an internet store, and there are a few good ones to choose from. Tim, how would you compare the Roland FP-90 to the Kawai ES-8? Thanks, Tim. So which portable stands would work with the ES8 that you would recommend? Availability price quote and payment method ! I just ordered an ES8 with stand and 3 pedal all in white. I can't wait. The sounds on Youtube are phenomonal and I know it will sound even better live. I have 2 Rokit 8" monitors with 10" sub and will finally have the most amazing piano sound. With some of these concert grands costing $180,000 it's unreal that I'm going to have a keyboard with close to 1/2 a million dollars worth of sounds. Really an impressive keyboard for a piano buff. Thank you for your comments. I answer general product questions here but only answer buying questions if you email me directly, then I would be happy to discuss that with you. Hi, thank you very much for all the valuable information. I am looking for a portable digital piano with highly responsive key action (speakers, bells and whistles not a must). Does the new RH3 come close enough to the responsiveness of the GF key action found on the more expensive MP11, as to justify the purchase of an ES8? (By the way, I am living in Japan, and the Kawai showrooms in my area don't seem to exhibit portable models. Hi, thank you very much for this site. My questions didn't seem to come through... Were they too long? How does this new RH3 key action compare to the GF key action of the MP11? The Kawai CA9700GP (GF Action II) seemed to me to have a much nicer dynamic range than the lesser expensive Kawai CN25 (RH3). I then compared the CN25 to a Casio PX-1500GP and I liked the sound and feel of the CN25 better, but the difference was smaller as I had previously imagined. On my way out I saw a Roland HP605. Having read the positive review, I felt curious enough to give it a try... and I just want to mention that I was really impressed by its beautiful sound and its nice feel! I think the ES8 actually sounds more real than any of the virtual pianos out there although it has less samples, that's because none of the virtual pianos recognize how fast or slow you release the keys. :P Only down side is that the Kawai's furniture cabinet stand for this is too high; the keys reside 5 cm above what they would do on a grand piano. You either need a higher piano bench or a lower stand. order.... always take Tim's advice here ! Hi! Thanks for the great review. My wife has played the piano ever since she was a child and played for our church for years. But we couldn't afford a piano at the time we got married so she seldom gets to play nowadays. With a child now, I think my wife really misses playing the piano and would like to teach our children herself as well. So I've decided to buy a digital piano as we don't have enough room for a real standup piano and I am considering 3 different options after reading a ton of reviews including yours. Kawai seems to be the brand that you recommend the most. The ES100 is more affordable and portable but has less additional convenience(controls, LCD, USB recording, external speaker use, connectivity etc). The ES8 is a bit expensive, less portable but convenience is the best, CN35 is about the same price as the ES8 but includes furniture thus is not portable, additional capabilities are good. I do think that we could use portability and connectivity occasionally even if they aren't deal breakers(or makers). Could you give any further advice? Thanks! Something that isn't very clear is if the ES8 allows FINGERED left-hand chords (not only one-finger chords) when using the accompaniments. Does the ES8 have "fingered" chords? yes, the ES8 has "fingered chord" mode that allows you to use full fingered left hand chords with auto accompaniment. Also, the fingered chord mode does other things too. If you have further questions about this and/or want info on where to purchase this model for less money and you are in the US, please email me directly. Do you know if there's a website we can share/download registrations for ES8 ? there is no web site that I know of for this type of activity. Hi Tim. Thank you for the review. How would you compare the P255 vs the ES8? I've read many good things about the P255, but some people say the keys are a little too heavy (mostly on the low notes), that that the MIDI functionality is not what one expects in 2016. And what about the main piano sounds? Thank you again. I would also like to know how you compare the Yamaha P255 to the ES8. Thanks Tim for your in depth review, it was really helpfull. What do you think when you compare the ES8 to the FP80? Fp used to be first pick when talking about tones and voice diversity and accompaniment responsiveness, but the layering restrictions and accompaniment bass line thing made you hesitate about it. Is there any diferences between the RH3 and ivory feel S? Do you thing the ES8 justifies the better piano feeling (againt the good ivory feel S), better layering postprocesing, and accompaniment issues over the FP80 At the cost of having less voices and sounds? I'd be very thankful if you could break down the main dealbreakers of those two. Thank you again for all the effort put in your work. The ES8 default piano is much superior to any of the Kawai pianos under $3000US, including the CN25. It is a different piano sound chip altogether in the ES8. 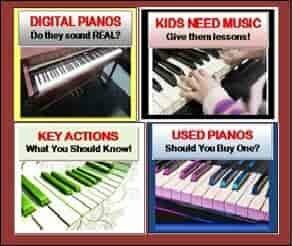 If you want more info or would like to purchase a new digital piano of any model in the US, please email me directly and I can help you. Thanks for your review on the ES8. I gave it a try the other day at a local music store. I like its auto accompaniment for its ability to recognize the chords while I was playing normally (the full-keyboard mode). However, I don't like the "auto fill-in" feature because sometimes I need to have control over exactly at which bars a fill-in is played. Is there a way on the ES8 to manually insert a drum fill-in while the "auto fill-in" feature is turned off? Thanks. 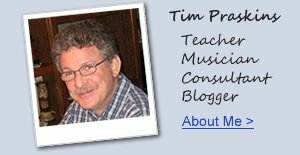 Reading between the lines on this site, Tim compares pianos within price range. If you ask if a $3k Kawai/Yamaha/Roland is better than a $1k, it's the $3k. And beyond that it's individual needs. So all else equal, MP11 is better at $800 more. It's in a different range from ES8. It has a huge advantage in key action, being more similar to an acoustic grand. Other sounds/features are better. Piano sound about the same. Beyond that you have to look at individual needs. If you're moving it to/from your car every week by yourself and aren't that strong, MP11 will give you trouble at 72 pounds (ES8 is 49 lbs). If you never play on acoustic grands and don't need that feel, you can save yourself the $800. And of course, ES8 has built-in speakers and MP11 doesn't, so it depends if you use your own speaker setups.